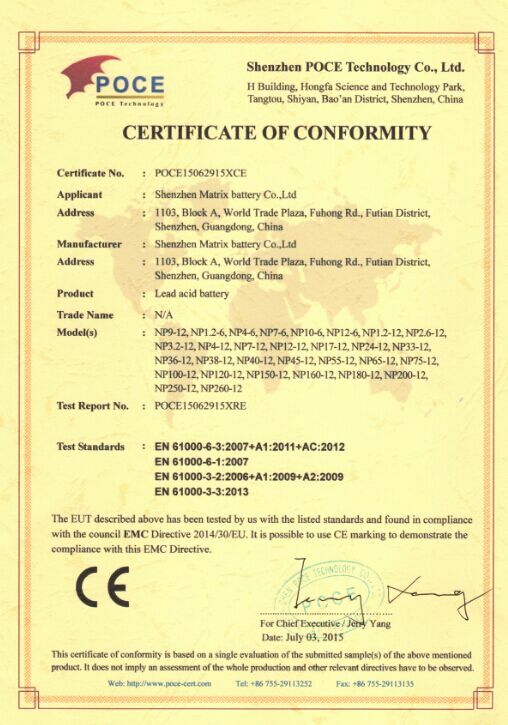 Company Overview - Shenzhen Matrix Battery Co., Ltd.
8YRSShenzhen Matrix Battery Co., Ltd.
Shenzhen Matrix Battery Co., Ltd. (MATRIX BATTERY for short) is a high-tech manufacturer specialized in the research, production, sale and service of all kinds of Matrix (brand) lead acid batteries. Our company is committed to studying and applying new materials in green energy field and making it industrialized. We mainly have four series of products, which are lead acid battery series for backup power, lead acid battery series for motorcycle, powerful lead acid battery series and stored energy lead acid battery series. The productive capacity of MATRIX BATTERY can reach 1 million Kilovolt Ampere/Hour per year with more than 600 staff members and advanced battery production technology and ability. Our company has been highly adhering to an entrepreneurship of "TO CREATE ONE MORE FAMOUS BRAND FOR THE WORLD ENERGY INDUSTRY" since our establishment in 1999. We continually enlarge our market by making HQ products and supplying power solutions with reasonable price. 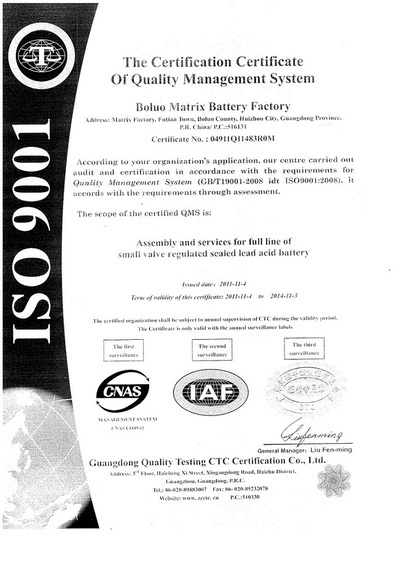 MATRIX BATTERY adopts advanced technology and fabrication for each item from preproduction to completion in manufacture according to ISO9001:2000 Quality Management System. The quality of our products has reached internationally advanced level. In order to share more social responsibility, our company organized a big and excellent sales group to sell products to the USA, Singapore, Hong Kong, Taiwan area and dozens of countries and regions.MATRIX BATTERY is the leading vendor supplying lead acid battery solutions. Our business covers a wide range of fields, including solar energy, wind energy, Telecommunications, electric power, UPS, emergency illumination, security, equipment, cars, motors, electric bicycles, golf carts, forklifts, boats, engineering machines, etc. We are working on providing scientific, high grade, and professional resolving plans to let customers have wonderful battery service in multiple important parts and enrich their modern life.Quality is the life of an enterprise. As a manufacturer specialized in the professional development, production and sale of batteries, we make products in accordance with the operation idea of "HONESTY, PRAGMATISM, COOPERATION, WINWIN". We also insist on the enterprise culture of "UNITY, PROGRESS, PROFESSIONALISM, REFINEMENT". We strive for the survival and development in the competition to push the matrix batteries to the world through diligent development and constant innovation. Your kindly calls and letters will be highly appreciated. We will do the utmost to serve you.